I frequently write about genetic engineering (GE) and genetically modified organisms (GMOs) on this blog, and I do that because GMOs are often misunderstood and villainized when, in reality, they have enormous benefits and a huge potential both for human health and protecting the environment. We can design them to have increased nutritional content (e.g., golden rice), to brown more slowly thus resulting in less food waste (e.g., arctic apples), to have reduced carcinogens thus lowering cancer risk (e.g., GMO potatoes), to be herbicide resistant thus increasing farming efficiency and reducing land use (e.g., Roundup-ready crops), to be resistant to insects thus reducing pesticide use (e.g., Bt GMOs), etc. Yet despite all these benefits, ill-founded arguments against GMOs abound. In this post, I specifically want to talk about the Bt GMOs, because they are particularly beneficial. I’ve written about their benefits at length before, but, in short, because they produce their own insecticides rather than having to be sprayed with insecticides, implementing them results in a massive reduction in pesticide use (Shelton et al. 2002; Cattaneo 2006; Lu and Desneux 2012), increased crop yields (Shelton et al. 2002; Cattaneo 2006; Vitale et al. 2010), reduced impacts on non-target organisms (e.g., bees and butterflies; Marvier et al. 2007; Wolfenbarger et al. 2008; Comas et al. 2014), improved bio-diversity (Lu and Desneux 2012), and enormous economic benefits for farmers (Hutchison et al. 2010). Given all these advantages when compared to either traditional or organic farming, you’d think everyone would be onboard with Bt GMOs. After all, by far, the three most common anti-GMO arguments that I encounter are 1). GMOs increase pesticides, 2). GMOs are bad for biodiversity/bees/monarchs, and 3). GMOs are somehow bad for farmers. These arguments are problematic in general, but they are clearly blatantly false when it comes Bt GMOs. 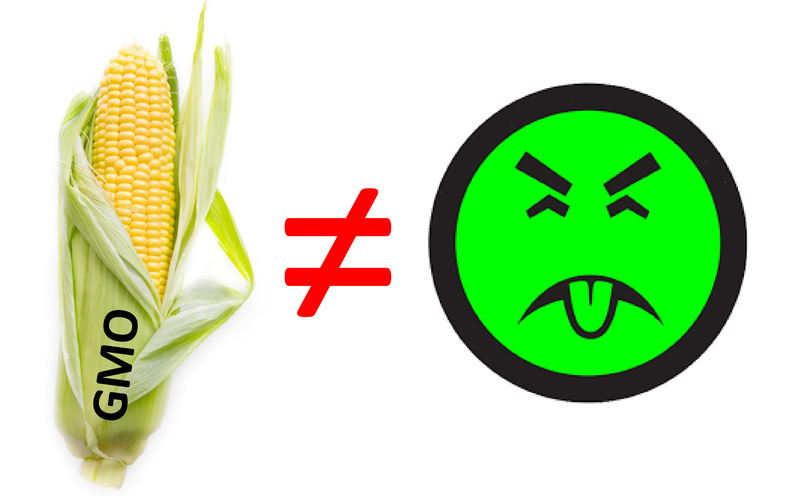 Nevertheless, Bt GMOs are villainized, often by arguing that they “obviously must be bad for human health since they produce their own poison.” This argument generally commits both an appeal to emotion fallacy and a common sense fallacy, but it is also indefensible scientifically, so I want to explain why it is a nonsense argument. What is Bt toxin and how is it used? To being understanding this topic, we need to take a step back and talk more generally about what Bt toxin is and how we have used it historically. It is a chemical (technically a group of chemicals) that is naturally produced by the bacterium Bacillus thuringiensis, and it is strongly insecticidal (i.e., it kills insects). When designing Bt GMOs, scientists took advantage of those insecticidal traits and modified the genes of various crops so that they too would produce Bt toxin. Thus, by expressing those genes, Bt GMOs can produce Bt toxin and kill any insects that try to eat them. In other words, you receive a similar exposure to Bt regardless of whether you eat GMOs or conventional/organic crops. I wanted to take the time to go through all this to make it clear that Bt GMOs aren’t producing some mad science chemical that was concocted in a lab (not that such a chemical would automatically be dangerous). Rather, they are making use of a chemical that is already widely used and that you are already constantly exposed to. The only difference is that for regular crops, the chemical has to be sprayed on entire fields, which wastes time, money, and water, increases greenhouse gas emissions, and kills any non-target insects in the field. In contrast, Bt GMOs produce the chemical themselves, which means that farmers don’t need to use nearly as many pesticides and only insects that actually eat the crops (i.e., pests) are affected. All of that is obviously a huge advantage for Bt GMOs both environmentally and economically. At this point, you may legitimately be wondering how Bt toxin can simultaneously be lethal to insects at a very low dose, but safe for humans and anything but an unreasonably high dose. The answer is something known as host specificity. All animals are biochemical machines that run via chemical reactions, and “toxins” or “poisons” operate by either impeding reactions that should be happening or causing reactions that shouldn’t be happening. However, different groups of animals have different biochemistry, and the biochemistry of a mammal (like you and me) is quite different from the biochemistry of an insect. As a result, the chemical mechanisms through which Bt kills insects don’t occur in humans. To put that another way, the fact that something is a poison to insects doesn’t automatically mean that it is a poison to humans. Without getting too technical, when Bt enters an insect’s digestive system, the alkaline environment causes it to release “Cry proteins.” These proteins bind chemically to specific receptors on the lining of the insect’s gut, which sets off a series of chemical reactions, ultimately resulting in the death of the insect. All of this is very specific to insects and simply cannot happen in humans. First, our stomachs are acidic, not alkaline. So, our stomachs largely degrade the Cry proteins rather than releasing them (Cao et al. 2010). Further, the Cry proteins that survive digestion still can’t do anything harmful because the guts of mammals lack the specific Cry protein-binding receptors that are found in insects (Noteborn et al. 1995). Additionally, even if the Cry proteins manage to bind with non-specific sites, the bond is generally weak and does not cause the damaging chemical reactions that occur in insects (Shimada et al. 2006). All of this simply means that Bt is very safe in humans because the mode of action through which it kills insects can’t occur in humans. In other words, Bt has a high host specificity (i.e. it very specifically targets insects while being safe for mammals). Thus, when talking about humans, it is incorrect to say that Bt GMOs “make their own poison,” because Bt is not poisonous to humans (except at a ridiculous hypothetical dose). Indeed, we consume many things that are poisonous to other animals but safe for us (e.g., chocolate is poisonous to dogs, avocados are poisonous to parrots, etc.). The conclusion that Bt is safe for humans has, of course, been borne out by numerous studies (reviewed in Hammond and Koch 2012; Hammond and Cockburn 2008). As is standard for toxicology studies, many of these used rat and mice models because our physiology is actually very similar to that of mice and rats, making them good models for understanding toxicity. These studies used crazy high doses (often 4000 mg/kg/day or more) that are way above what you would ever receive from eating GMO crops, and they still failed to find any adverse effects. To get that type of dose in your food from a Bt crop, you would have to eat several hundred thousand kilograms of produce a day (Hammond and Koch 2012)! It is, quite simply, not possible for you to eat enough vegetables to get anything even close to a dangerous dose of Bt. Even Jabba the Hutt on a vegetarian diet couldn’t achieve a toxic dose from eating Bt GMOs. Also, keep in mind, those absurd doses weren’t for LD50s; they were being used to look for any adverse effects and failed to find any. So the dose that actually starts to cause problems in humans is even higher than the already absurd doses being used in those studies. Note: I’m assuming that Jabba the Hutt also lacks Cry protein-binding receptors. I’m not sure if that’s canon. At this point, it should be obvious that the production of Bt toxin by Bt GMOs does not pose a health risk, because the toxicity of Bt to humans is so incredibly low. Nevertheless, multiple studies have looked at the effects of consuming Bt GMOs (rather than just Bt toxin), and, as you might have guessed, they did not find any evidence that that Bt GMOs are less nutritious than conventional crops, nor did they find any evidence that consuming Bt GMOs is harmful (even when consumed in large quantities, daily, for months at a time; Flachowsky et al. 2007; McNaughton et al. 2007; Schrøder et al. 2007; Scheideler et al. 2008; Yuan et al. 2013). Indeed, there is evidence that Bt GMOs are actually safer than their conventional/organic alternatives, because Bt GMOs have reduced mycotoxins (these come from fungi that like to live in holes made by insects; Pellegrino et al. 2018). Another counter argument is that the real danger is that horizontal gene transfer will take place and the genes for Bt will end up either in our genome or the genome of some gut bacteria (horizontal gene transfer is where one organism incorporates another organism’s DNA into its own genome; it is basically nature making a transgenic GMO). This is a concern that I frequently hear about GMOs, and it is unmerited for numerous reasons. First, your digestive system does a pretty good job of ripping apart and degrading DNA. It’s not likely that entire genes will make it past the stomach (Rizzi, A. et al. 2012; Yuan et al. 2013). Second, even if they did, why should the one or two genes that we put into a GMO be more concerning than the millions of genes in everything you eat!? When you eat an apple, you ingest the entire genome of an apple (which includes things like genes for producing cyanide); yet I have never heard anyone express concern over horizontal gene transfer from an apple. So, this argument is completely disingenuous. Why should you be concerned about the genes for Bt in a GMO but not concerned about the genes for cyanide in an apple? Further, Bacillus thuringiensis (the bacteria that we got the Bt genes from) is an extremely common environmental bacteria. I guarantee you that you have eaten that bacteria numerous times in your life. Further, other bacteria that you have ingested have surely been exposed to Bacillus thuringiensis before being ingested. In other words, there are plenty of opportunities for Bt horizontal gene transfer without GMOs, yet no one is concerned about them (with good reason). Like so many anti-GMO arguments, this line of reasoning holds GMOs to an extremely different standard than everything else. It’s just not a legitimate concern. I’ve saved this one for last because it is, quite frankly, silly. Nevertheless, I do encounter it from time to time, so let’s talk about it. This argument asserts that what I have said about doses is wrong, because the crops will continue to produce Bt toxin while inside you (thus creating high doses). The problem with this is obviously that vegetables are not continuing to perform biological processes in your gut. They are dead, chewed up, and digested. This argument is like being worried that swallowing a seed will cause a tree to grow out of your stomach. The argument that Bt GMOs are dangerous because they “make their own poison” is a nonsense argument. It appeals to emotions and the notion of common sense, rather than scientific evidence or logic. The reality is that Bt toxin is host specific, so while it is fatal to insects at even a very low dose, it is safe for humans at even an extremely high dose. Further, it has been used as a pesticide in both conventional and organic farming for decades, and the amount of Bt you are exposed to from Bt GMOs is very similar to the amount you are exposed to from regular crops. Bt GMOs have been extensively studied and are extremely safe. Even if you ate thousands of kilograms of produce a day, you still would not receive anything even close to a dangerous dose of Bt. Finally, you don’t have to take my word for this. There is an extremely strong consensus on this topic in the scientific literature, and I have only cited a tiny handful of the available studies. Here are some literature reviews that are worth reading: WHO/IPCS. 1999, Betz et al. 2000, OECD. 2007, Hammond and Koch. 2012, Koch et al. 2015. Cao et al. 2010. Safety assessment of Cry1C protein from genetically modified rice according to the national standards of PR China for a new food resource. Regulatory Toxicology and Pharmacology 58:474–481. McNaughton et al. 2007. Feeding performance in broiler chickens fed diets containing DAS-59122-7 maize grain compared to diets containing non-transgenic maize grain. Animal Feed Science and Technology 132:227–239. Noteborn et al. 1995. Safety assessment of the Bacillus thuringiensis insecticidal crystal protein CRYIA(b) expressed in tomato. p134­–147 In: Genetically Modified Foods: Safety Issues. Engle et al. eds. American Chemical Society, Washington, DC. Rizzi, A. et al. 2012. The stability and degradation of dietary DNA in the gastrointestinal tract of mammals: implications for horizontal gene transfer and the biosafety of GMOs. Critical Reviews in Food Science and Nutrition 52:142–161. Scheideler et al. 2008. Evaluation of nutritional equivalency of maize grain from DAS-Ø15Ø7-1 (Herculex I) in the diets of laying hens. Journal of Applied Poultry Research 17:383–389. Schrøder et al. 2007. A 90-day safety study of genetically modified rice expressing Cry1Ab protein (Bacillus thuringiensis toxin) in Wistar rats. Food and Chemical Toxicology 45:339–349. WHO/IPCS. 1999 Environmental health criteria: microbial pest control agent Bacillus thuringiensis. International Programme on Chemical Safety. Geneva, Switzerland. This entry was posted in GMO and tagged appeal to emotion fallacies, Bad arguments, GMOs. Bookmark the permalink. Thank you for this thoughtful addition to the public dialog. I’m very much in favor of GM foods, and offer this in the spirit of making your piece stronger: what about unintentional gene transfer to a widespread non-crop organism? Is there any chance of, for example, prairie grasses acquiring the Bt-production gene, leading to insect die-off and ecosystem collapse? Hope this isn’t too far off-base for consideration here. The first is that technically, yes, they could hybridize, but they can only do so with closely related species, and usually, GMOs are not grown near their wild counterparts. So in most cases, this is not a concern. Second, it is worth pointing out that this can also happen with conventional crops. All of our crops have been genetically modified one way or the other, and even non-GMO crops contain genetic material and traits that aren’t found in nature. So this is not a potential problem that is exclusive to GMOs. Finally, even if a Bt GMO crossed with a wild relative, this would not lead to an ecosystem collapse, because Bt GMOs only affect insects that eat them, and a closely related wild species would have the same insect pests as the crops. Thus, it would only affect the pest species that farmers are already trying to reduce. I agree that GMOs have protential, yet has it actually increased yields and decreased pesticide use significantly? I’ve read that improvements to agriculture have been minimal overall and so far the technology has not produced any significant results in actual large scale use. So, in short, yes the benefits are substantial and well-documented. Many people often still feel uncomfortable about this whole Bt toxin thing even after explaining that it only affects insects, not mammals. I found that it sometimes improves understanding if I point out toxic specificity in life forms rather closer to us than insects, both in a literal and figurative sense: our pets. We can happily munch away a pound of grapes without any ill effects. But even a few grapes can be life-threatening to a dog, causing acute renal failure (although the reason why is still unclear). More or less the same goes for citrus fruits (which are very healthy for us primates), chocolate, and lots of other foodstuffs. The opposite is often the case too: dogs often eat carrion and even other animals’ excrement without any ill effects, whereas it would be unwise in the extreme for us humans to do the same. Or look at birds: they can eat lots of types of berries that are quite poisonous to us. I think it’s safe to say that there are relatively few toxins that are poisonous to all animals (things like arsenic come to mind), but also that there are almost no compounds that are harmless to all animals. Name anything that’s nutritious to one type of animal, and it’s bound to be unhealthy to one or more other animals.